Omni Cable 10/4 Flexible SOOW portable cord in yellow color, has ethylene propylene diene monomer insulation. 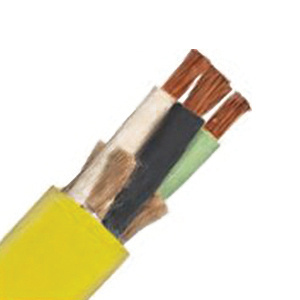 The tinned copper cord has a voltage rating of 600-Volts and temperature ranging from -50 to 105 deg C. Cord remains flexible for long duration in cold temperatures. The cord with Super Vu-Tron® supreme jacket, is resistant to flame, heat, cut, abrasion, ozone and weather. It is ideal for use with machine tools, power tools, dockside power applications, motor leads, portable machinery, cranes and submersible pumps. The SOOW portable cord meets UL, CSA, MSHA, RoHS and OSHA standards.